As your kids get older, their biannual dental checkups and cleanings become more important, not only for their oral health but their overall well-being as well. But as a parent, you probably already know how the very first visit can be a little scary both for you and your little one. If you have a son or daughter who is soon to make that initial visit, then you should read on. Encourage your child by giving him or her positive words, explaining that the dentist is a friend and the dental office is a nice and happy place. More importantly, reassure that there is absolutely nothing to be worried about or scared off. After all, the dentist will only make those little teeth whiter and prettier! Be creative with it! Search for children shows and find books that tell fun dental stories. There are a lot of materials available online. You can also try playing pretend with your child. If it helps, buy some safe toy dentist tools at the nearest toy store. Take turns in being the patient and the dentist. This will give your child the idea that a dental procedure is fun and actually stress-free. Take your child grocery shopping where you can encourage him or her to choose his very own dental supplies. Let your little one pick out his or her own toothpaste, toothbrush, and dental floss. This will tell your child that you are allowing him or her to make the decisions about caring for those pearly whites. As early as possible, teach your child the importance of keeping his or her teeth and gums healthy. Let your toddler know that brushing teeth after every meal and visiting the dentist means no cavities! 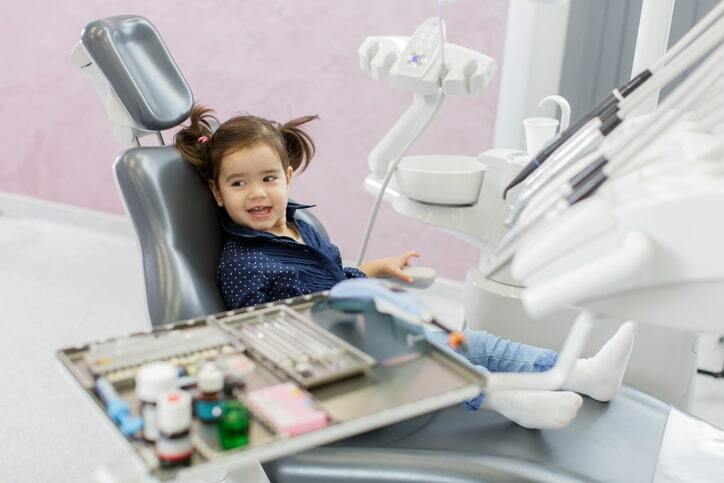 Choose a dental facility that is child-friendly. You don’t know how bad it can affect your child’s attitude towards going to the dentist if the hygienist or even the receptionist is somewhat rude or even just really formal. You want to make sure that you go to a dental office that welcomes children and whose staffs know how to make kids’ dental visits fun and hassle-free. Is your child big enough for that first dental visit? Start preparing him or her at home and when everything is ready, come and visit us at Pickering Square Dental! We’ll make sure your little one’s initial visit to the dentist is a memorable one… in a really good way! We are accepting new patients! Pickering Square Dental continues to grow and continues to accept new patients. If you are considering a new dentist for you and your family, we invite you to stop by to meet our team and take a tour of our office or to schedule an appointment.